Donald J. Trump is making television commercials "great again." On Monday, his campaign released its first TV ad of the 2016 presidential race, and it doubles down (triples? quintuples? Whatever, it’s huge) on some of the reality star’s more outrageous campaign promises. 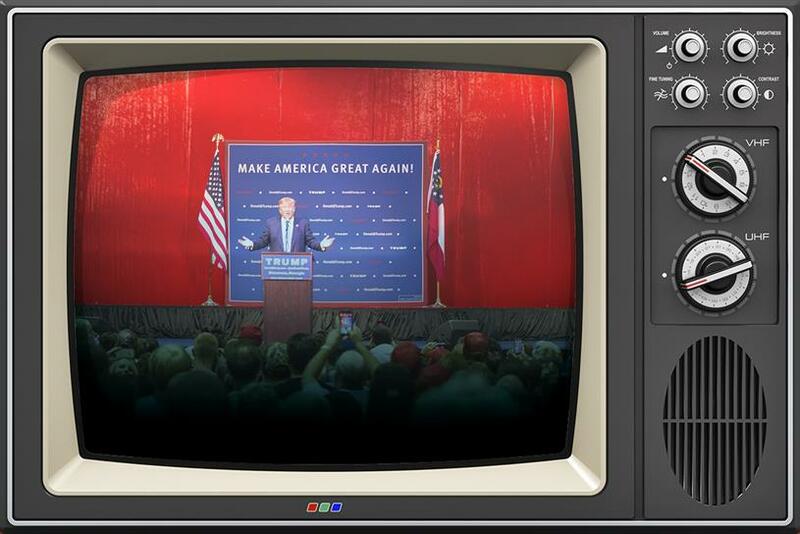 Trump knows his audience, but will this multimillion dollar ad spend actually help him in the primaries? It’s a greatest hits of the latest Trumpisms, from renewing his call to ban Muslims from entering the United States, to vowing to destroy ISIS and "take their oil" to insisting that Mexico will fund a border wall. "I don’t know if I need it, but I don’t want to take any chances because if I win we are going to Make America Great Again," Trump said of the new ad in a statement. "I don't see this as an attempt to change opinions or behaviors. He's trying to galvanize the white, male, disenfranchised voter who is increasingly feeling that they are losing their perch atop the American food chain," said Robb Henzi, senior director for strategy at the agency We Are Social. "They are his base — he isn't really trying to woo any new supporters with this one. And they make up a huge percentage of caucus voters in Iowa, a state he needs to win, or come very, very close to winning." Even though the bombastic tone of the new ad will get plenty of media attention, as well as plenty of rage-induced social media sharing, it’s likely that the Trump campaign is finally acknowledging that earned media isn’t enough to secure the Republican nomination. Last year, Trump’s spending priorities were different. In the third quarter of 2015, the campaign only spent a total of $6,000 on two radio ads, far less than the $780,000 it spent on branded hats and T-shirts in the same period. Since then, it’s dropped between $200,000 and $300,000 on six radio spots, several orders of magnitude less than some other candidates. "Everyone knew he would eventually open up his wallet from an advertising perspective," Henzi said. "He didn't have to, out of the gates, because he was pulling in such a massive share of media coverage compared to other candidates, but, even though he still maintains this share, he now he needs to take control of his own narrative a bit more tightly." In keeping with Trump’s public persona, now that the campaign is really spending, it’s spending big. Six to eight ads are planned to run, at a cost of $2 million per week — $1.1 million for Iowa and nearly $1 million for New Hampshire, the states that host the first caucus and primary in the nation, scheduled for early February. Even beyond those two contests, Trump said the buy will continue for several months, with money shifting to other early-voting states like Nevada and South Carolina. In what may be a concession to accusations of sexism, the campaign is also releasing two radio ads this week featuring endorsements from groundbreaking female soldiers: Kathryn Gates-Skipper, the first woman to engage in combat operations as a Marine, and Nancy Mace, the first woman to graduate from The Citadel. With just a few weeks to go, candidates from both parties are ramping up ad spending. At the end of December, Republicans Ted Cruz and Marco Rubio both released new TV spots, and John Kasich unveils only his second TV ad of the race on Tuesday — a rousing bit of Americana with narration apparently inspired by commercials for Chevy trucks. The Democratic race is just as hectic — between them, Hillary Clinton and Bernie Sanders released 15 TV and radio ads in December alone. Ad spending is predicted to top $4 billion this election cycle. The campaigns must file their expenditures with the Federal Election Commission by the end of January, so that data will provide a clearer picture of how accurate that prediction will prove to be.